The Linn County Mayors’ Bike Ride is canceled for 2018, due to severe weather concerns. 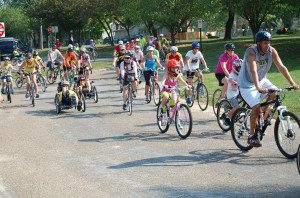 The annual Linn County Mayors’ Bike Ride is a free, educational bicycle ride organized as an opportunity to showcase the continued need and development for multi-modal transportation networks in Linn County. This year’s ride is Monday, September 3, 2018 (Labor Day). The event is unique as it allows elected officials to directly interact with constituents interested in trail development. And, for many citizens, the opportunity to speak to elected officials is an irregular opportunity. Providing both elected officials and citizens the opportunity to engage about trail development, the Mayors’ Bike Ride is a mission driven event that results in more collaboration between the public and government. Whether you are a social bicyclist, an avid bicyclist, an interested citizen and/or elected official, we invite you to participate in the Linn County Mayors’ Bike Ride. 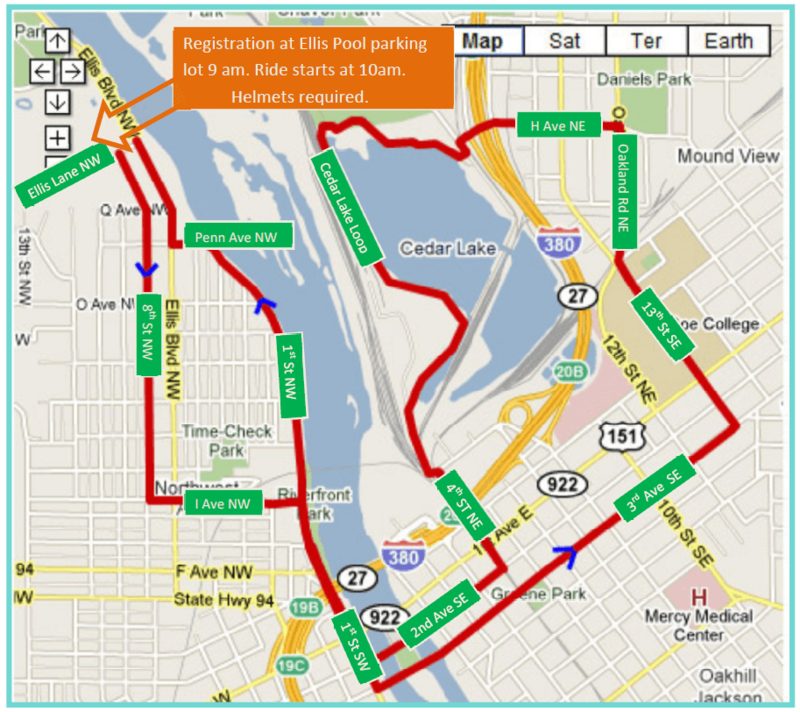 Routes – There is an 8.5 mile route that goes through all four quadrants of Cedar Rapids. There is also a 2.5 mile ride for those not interested in embarking on a longer route (see route details below). Cost – The event is free to participate in. Safety – Helmets MUST be worn, or participation will be denied. Registration – Registration starts at 9 AM in Ellis Park. Ride starts at 10 AM. The event is coordinated and sponsored by Linn County Trails Association and Bike CR. 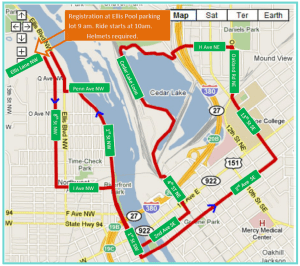 Below is a map of the 8.5 mile route. The 2.5 mile route starts the same as the 8.5 mile route. Once arriving to 1st St NW, participants on the 2.5 mile route turn left, instead of right. Volunteers are along the course to help with directions. 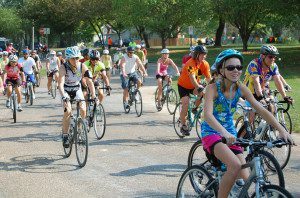 A large group of riders prepare for the Linn County Mayor’s Bike Ride in 2012. 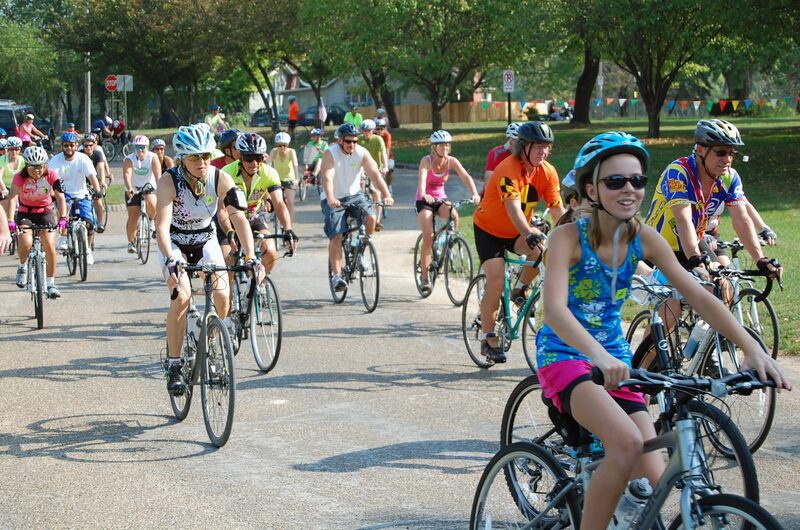 Riders young and old partake in the Linn County Mayor’s Bike Ride in 2012. 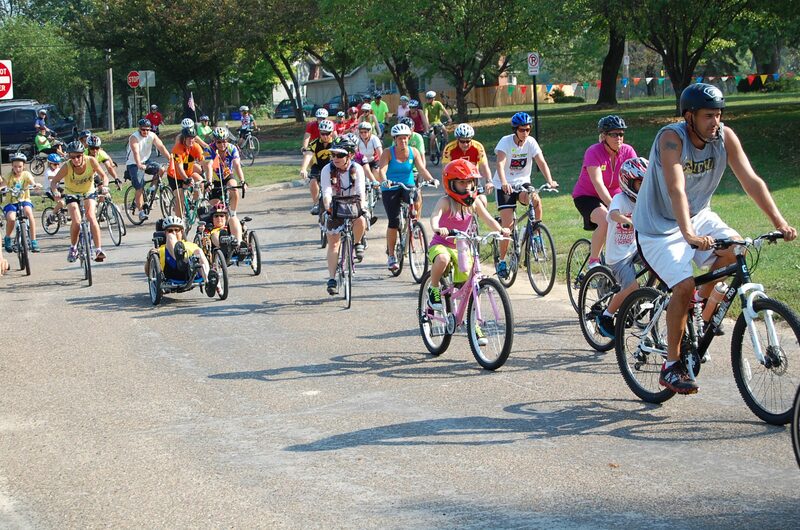 A group of riders leaving the Ellis Park Pool parking lot during the Linn County Mayor’s Bike Ride in 2012.